Review Summary: MEHBOOBA comes too late in the day. Had it released in the 1990s well it might've been a huge grosser. None of the cast acts. Certainly don't waste three hours of your life on this time-na-pass. The name of the film is Mehbooba—a point reiterated over a hundred times in the film through its dialogue and song lyrics, an old-hand technique once considered clever. MEHBOOBA comes too late in the day. Had it released in the 1990s well it might've been a huge grosser. The time's over for these treacly tales by now. Specially when all the actors have aged and progressed to more meatier roles. 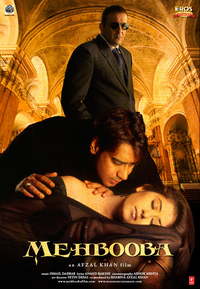 'Mehbooba' comes across with the likes of Sanjay Dutt, Ajay Devgan and Manisha Koirala. You might be wondering how come Manisha plays the heroine in 2008 when she has almost vanished from the film circuit. Well, take a closer look at a much slimmer Manisha and the drastically younger looking Sanju Baba and you will definitely figure out that the movie is maybe over 68years old. A typical Bollywood film, it is suitable for those who go for formula films.